Back in 2016 with iOS 10, Apple changed their gun emoji to a water pistol. They received some criticism and the move was not widely adopted. Until now. 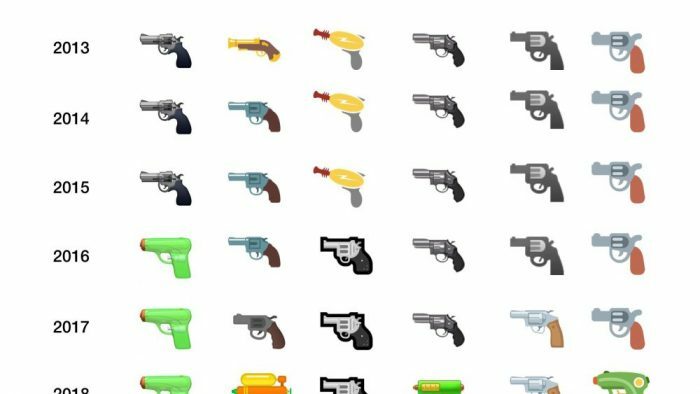 Google changes their gun emoji to a water pistol in the upcoming version of Android. According to Emojipedia, Google today updated its NotoColorEmoji library with a new emoji design. The current realistic revolver with a dark gray barrel and brown handle has been replaced with an equally realistic water pistol that is brightly colored in yellow and orange with hints of green and blue. In line with Google’s other modern emoji, there is a fine attention to detail. Interestingly, the preceding version of the emoji was just revamped in 2017, with the prior version in use for three years. Before that Google used a musket, while in 2012 Google used the generic outline of a modern handgun. As Emojipedia notes, Google — following Apple’s decision in 2016 — was cautious about changing, citing a desire to maintain “cross-platform communication.” However the landscape in 2018 has changed with Twitter and later Samsung on the Galaxy S9 switching to a water pistol. Given the momentum, it makes sense Google to follow along to ensure that communication across platforms is consistent. The new design should be adopted system-wide with the launch of Android Plater this fall.